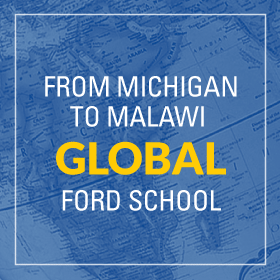 This graduate-level course allows Ford School students to complete a commissioned policy research project for a public-sector client. Under the direction of a faculty advisor, students have tackled dozens of significant public policy problems for organizations like Amnesty International, the U.S. Government Accountability Office, and government officials. 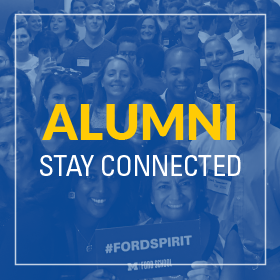 The Ford School’s Applied Policy Seminar is a semester-long Master’s level course that engages students in a supervised consulting project with a real-world client. Teams of 3-6 students work with a faculty coordinator and client representative to: develop a project work plan; collect relevant materials and information; conduct research and analysis; prepare a written report; and present findings and recommendations to the client. Students are expected to produce professional-quality work at minimal cost to the client. In return, clients are asked to help provide students with a valuable, engaging educational and professional experience. To discuss the process and outcomes or to submit a proposal, interested organizations can contact Elisabeth Gerber, Professor of Public Policy, at ergerber@umich.edu of 734-647-4004. City of Ann Arbor, MI, Energy Efficiency Investments: Estimated economic impact of city’s energy investments. Government Accountability Office, Options to Extend Labor Force Participation to Older Americans: Conducted mixed-methods analysis of labor force trends, barriers, opportunities. US Department of Justice, ICITAP Philippines, Competency Framework: Developed job classification scheme for PNP. ICITAP WDC, Strategic Planning: deconstructed previous strategic plan, developed planning framework. Jordan Morgan Foundation, Capacity Building: Developed materials, supported strategic planning process. Networks Northwest, Traverse City Affordable Housing Study: Undertook stakeholder analysis and peer comparisons. FocusHOPE, New Mobility Options for Hope Village Residents: Conducted demand analysis for possible introduction of local ride-hailing and car-sharing services. Downtown Detroit Partnership, Redevelopment of 600 Randolph: Identified redevelopment opportunities. State of Michigan Talent Investment Agency, Michigan Works! and WIOA Implementation Reform: Provided background research to support state-level reform efforts. Government Accountability Office, New K-12 Education Assessments: Assessed implementation of new education assessments under recently adopted consortium agreements. City of Detroit, Mayor’s Office, Detroit’s Neighborhood Enterprise Zones: Studied the effectiveness of Detroit’s NEZs in stabilizing neighborhoods and attracting new residents. Flint City Charter Commission, Technical Assistance: Analyzed alternative municipal forms of government and other proposed reforms. ICITAP WDC, Promoting Sustainable Institutional Development: Evaluated program’s sustainable institutional development initiatives. Presbytery of Detroit, Defining and Engaging Community: Devised a community engagement strategy for Greenfield Presbyterian Church. 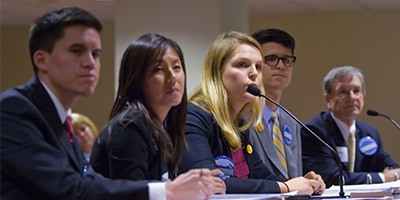 Christopher Falcone (MPP '14), Matthew Papadapoluos (MPP/MA '13), Erin Sullivan (MPP '14), and Jessica Teng (MPP '14) appeared in front of the House Commerce Committee to testify on House Bill (HB) 4996 which would allow equity crowdfunding in Michigan. The students had been working on this issue as part of their Applied Policy Seminar, taught by Professor Elisabeth Gerber. Read this success story. Ford School master's students Patrick Leonard, Tyler Sawher, Dan Trubman, and Eboni Wells presented proposals to local officials, community leaders, and residents that would repurpose the GM Powertrain Plant Facility and the Willow Run Airport as a waste management facility, or "Energyopolis," and "Willow Network," a research hub. Read this success story. On behalf of a group of business and civic leaders from Lenawee County, Michigan, students identified opportunities for cost-savings and efficiency gains through shared municipal service provision. Students conducted surveys of local governments, created a catalog of public facilities, and forecasted cost savings under various scenarios. View a video about this story. Complete a project proposal form. Schedule a consultation with Professor Elisabeth Gerber (ergerber@umich.edu, 734-647-4004). Proposals for Fall semester projects (September – December) must be submitted by March 1. Proposals for Winter semester projects (January – April) must be submitted by October 15. Selected projects will be notified within six weeks after the submission deadline. What makes a successful Applied Policy Seminar project? The project should deal with an important public policy problem that presents a significant challenge or opportunity to the organization. The project should engage students in a range of multi-disciplinary research and analytical activities such as researching best practices, conducting archival research, interviewing or surveying stakeholders, analyzing financial documents, conducting cost benefit analysis, etc. The client organization should designate a knowledgeable contact person who is available to provide students with information, access, and guidance. The project needs to be successfully completed in 13 weeks. Addressing slum redevelopment issues in India, building a supplier dashboard for sustainable harvests, investing in smarter water resources in Sudan, and more. "It was great being able to learn from some of the most prominent leaders in the African-American community at the conference," said Trevis Harrold (MPP '17). 140 master's students were joined by 54 outside experts to participate in a three-day policy simulation on regional cooperation, economic development, and green energy.